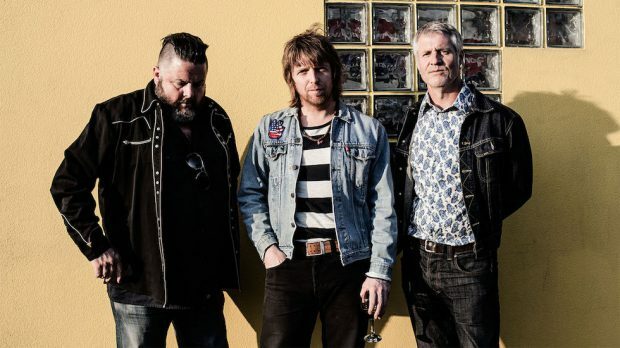 Since their formation in 1994, Melbourne trio Even have built a passionate fanbase endeared by their unwavering penchant for catchy Aussie indie rock. In 2018 the group have re-emerged with their first album in seven years, Satin Returns, which they are celebrating with a national tour kicking off at The Boston on Saturday, July 21. For frontman Ash Naylor, the album didn’t just roll off the mill in the way their previous works might have done. With challenges and tragedies in the band members’ lives, and families becoming the focus of their attention this was one they were happy to sit on until the time was right. BRAYDEN EDWARDS caught up with Ash Naylor to chat about re-stoking the musical fire as the group mature as people and artists, and why although some things have changed over the years, writing, performing and touring new music is as rewarding for Even as it ever was. Firstly, congratulations on the new album. It’s been a little while since we’ve got a full length from you guys. What have you been up to of late? We’ve all had adult concerns, you know? We’ve had lives to live and people to farewell. Both my parents passed away in the last few years and the others guys have have dealt with difficult challenges with their families as well. So there’s been big life issues to deal with that have overtaken the musical side of things but that’s how I operate. I never really put creativity or art before those kinds of life issues so for us the record got finished when it got finished. It might have been frustrating for some people but I wasn’t going to force something out. It was just going to be ready when it was ready and then out it came. So is that quite different from how previous albums have come out? Working on it when and when you can until you were happy with it? Yeah, well we started recording in January 2014 and at that point a lot of the songs were instrumentals so I took some time to listen to them and finish writing the lyrics for songs afterwards. I wanted these songs to stand up as instrumentals on their own because I always felt songs so should do that while the vocal and the melodies should really be more like the icing on the cake. Have you always had that kind of approach or was that something new for this record? Well circumstance did have something to do with it. Some of these songs were written two or three times before I settled on the lyrics. Back in the 90s when we were playing all the time, writing all the time and recording all the time I wasn’t over-analysing it so much and just going with the flow and enjoying the momentum of that. But nowadays we don’t have that same kind of momentum happening by itself, we have to create it ourselves. We’re not on the crest of a wave and getting played on triple j right now anymore you know? Back then everyone wanted a piece of us but now we’ve got to make people want a piece of us (laughs). Yes you’re absolutely right there and thankfully as a band we’ve never been ‘in’ or ‘out’. We had our moment in the sun in the mid 90s and a lot of that was a band like You Am I opening the doors for a power pop/rock bands like us. We all had a great time then but now I still feel like we’re all improving and we’re not resting on any laurels and viewing this world from a place of privilege. We’re probably still more punk than punk bands and more hippy than hippy bands and still a very grass roots, humble operation. So musically, how have you changed what you listen to and what you are influenced by now as compared to back in the day? Well maybe to my detriment I’m probably still influenced by the same things. It’s not like I come from the Radiohead school or anything feeling like I need to reinvent myself every time I make a record. I’m more from the AC/DC school where I’ll try to refine and mature and make the same record but better every time. I’m still influenced by the greats like The Beatles, The Stone Roses, Led Zeppelin and The Smiths. I’m still being influenced by the same bands that shaped me as a person as a teenager. Having said that it’s always great when a new band comes up like Tame Impala or Temples that remind you that great songs are the beginning and end of a great band. I judge bands more for their songs than their sound but I do gravitate to a more guitar orientated sound because playing guitar is a real passion of mine. I heard that for the first single off this album The Opener you drew some inspiration from some of your favourite opening tracks from albums that you love by The Smiths and Led Zeppelin that you mentioned before. So as someone who has clearly put a bit of time and thought into it, what makes a great opening track for an album? I think in this case we wanted something that was really strident and unrelenting. That song was called as such because it always had to be the opening track for this album. Without wanting to sound all self-grandeur or anything those songs like Achilles Last Stand and The Queen is Dead really were mission statements. They’re songs that say “here we are and this is what we’re about, we haven’t reinvented the wheel, we’re just doing what we love and you can take it or leave it” you know? Given that there has been a lot more time spent on this album than those previous and as you mentioned before you’ve gone through a lot more life experiences in that time, does that make it easier or harder when putting lyrics to the music? It’s another great but difficult question. You’d think it would be easier when you have more time but then you find that you’ll over analyse things as a result of that as well. Because there wasn’t as much of a hurry to put a record out there was also no end date or deadline so it can work against you too. Having those massive life experiences helped and hindered us. We all needed to come through it together as well. We just couldn’t have released the record when all the crazy stuff was going on. It’s also a reflection of the band as well, that we’re still the same people that formed the band 24 years ago and that we’re still making music together. And on your album tour and specifically your show in Perth are you looking to play much of this new material or is there still going to be a good mix of some of your earlier work too? We’re not arrogant enough to make the show all about our new material. We go to shows ourselves and know what we like to see when we go to see a band. The kind people of Perth who come to our show will certainly get a cross section of everything we’ve done since 1995 rather than bludgeoning them to death with only new stuff. And given this is the first stop on the national tour, have you played all the new songs live yet? Would you be equipped to bludgeon people with just the new stuff if you wanted to? We’ve played a few songs from when we did a launch show in Melbourne back in May but it will be nice to play them some more. Another thing that was really special about this record was that it was just the three of us. We didn’t resort to any extraneous overdubs or extra sounds like brass or keyboards or guest vocalists. All the noises were made by us, so it shouldn’t be too hard for us to replicate in a pub. But that’s part of the fun of going on tour, getting on a stage and taking these songs and bringing them to life in front of an audience.